The Weed that Strings the Hangman's Bag. What a title! You don't know how I've mangled it in my mind. But after reading the book, it makes perfect sense. I fell in love with Flavia de Luce in The Sweetness at the Bottom of the Pie last year. I couldn't wait to get my hot little hands on The Weed that Strings the Hangman's Bag . It was worth waiting for. This time Flavia meets a TV puppeteer and his assistant when their van breaks down in the church parking lot. The vicar invites them to stay and perform for the villagers and Flavia agrees to help out. When the puppeteer comes to a spectacular end onstage, Flavia dives into solving the case. Rupert Porson was no Mr Rogers and his connection to the village is more complicated than it first appears. I won't go into any more details because half the fun is not knowing what is going to happen next. Flavia continues to disarm adults with her school girl smile that hides a devious mind. She still works away making poisons in her lab and contemplating wicked revenge on her terrible sisters. Sister Feely puts a move on a former German POW with a Bronte obsession. Her father is distracted as ever by his own demons and the arrival of Aunt Felicity brings surprising facts about Flavia's deceased mother. I enjoyed learning more about Flavia and her family as much as I liked the mystery aspect of the book. I was glued to this book all weekend. Alan Bradley's writing is smart and humourous; I'm so glad he's writing book number 3 already (A Red Herring without Mustard). Can't wait! More Flavia please! Thanks to Random House for the review copy. I just loved Flavia as well. I can't wait to see what adventures she comes across in the third book. I read a review on this last week and immediately added it to my wish list. You have echoed the earlier comments I read. This series sounds so good. I have Sweetness on my phone and hope to listen to it soon. Thanks for the review, will look into this one. 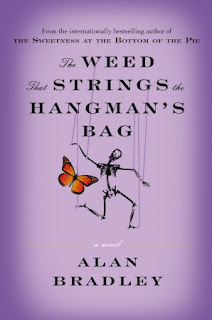 I href="http://readingthroughlife.blog.com/2010/03/09/the-weed-that-strings-the-hangmans-bag-review/" target="_blank">reviewed this one a few weeks ago! I definitely need to go back and read The Sweetness at the Bottom of the Pie soon ... that little girl grew on me. So good to see that I am not the only Flavia fan! I can't wait to read the new one!